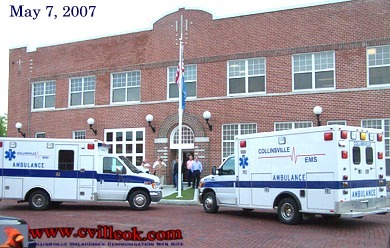 The city commissioners viewed the newest Collinsville ambulance (left) during a short break in the meeting Monday evening. The Collinsville City Commission met Monday, May 7th (at the City Hall Community Room, 106 N 12th Street) for a 7pm regular meeting of the City Commission and Municipal Authority. 4. CONSENT: All items listed under the Consent Agenda are deemed to be routine in nature by the governing body. They will be approved by one motion of the governing body. Items on the consent agenda will not be discussed. Any member desiring to discuss an item may request that it be removed from the Consent Agenda and placed on the regular agenda. It will then be considered and discussed. A. 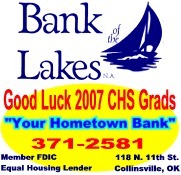 Approval of minutes of the Collinsville Municipal Authority Regular Meeting of April 16, 2007. B. Approval of disbursements and payroll. C. Supplemental Appropriation for $2685.00; Smalygo Properties reimbursement for engineering services. D. Supplemental Appropriation for $407.52; Refund for insurance from OMAG. Honeywell was here this week to start collecting information on energy savings evaluation. City staff collecting meter information. Bids also let for waste water and Black Jack improvements. 10. Discussion and possible action to accept the receipt of the permit for Collinsville wastewater treatment plant improvements. -- item tabled as incorrect housing addition names found in document wording. 11. Consideration of any new business, which can be considered an emergency, to come before the City Commission not known about or which could not have been reasonably foreseen at the time of posting this agenda. 2.Roll call and declaration of a quorum. 3. CONSENT: All items listed under the Consent Agenda are deemed to be routine in nature by the governing body. They will be approved by one motion by the governing body. Items on the consent agenda will not be discussed. Any member desiring to discuss an item may request that it be removed from the Consent Agenda and placed on the regular agenda. It will then be discussed and considered. A. Approval of minutes of the April 16, 2007 Regular meeting. C. Cemetery Deeds: Frank and Yvonne Bourbonnais (2 spaces): Robert C. Lane (1 space): Virginia Bordwine (1 space). D. Supplemental Appropriation of $750.00; Donation from Victory Energy to the DARE program. E. Supplemental Appropriation of $131.76; Volunteer firefighter's payment towards rescue equipment purchased. F. Supplemental Appropriation of $790.00; The final payment of the Homeland Security Grant from 2004 to the police department..
4. Discussion and action on items removed from the Consent Agenda. 5. Discussion and possible action on the closing of Main Street from 7th street through 14th street for Hog's N'Hot Rods festival Saturday June 9th. 6. Consideration of any new business, which can be considered an emergency, to come before the City Commission not known about or which could not have been reasonably anticipated at the time of posting this agenda.